MasterSingers performers will be presenting hit songs from your favorite artists & shows without regard to gender or age. Yes, that's right, anything goes during this cabaret event. Enjoy old favorites in a whole new way during this topsy-turvy night of entertainment. This 21 & over event starts at 6:00 p.m. with an amazing appetizer & dessert buffet with singers taking the stage at 7:00 p.m. to share their talents. 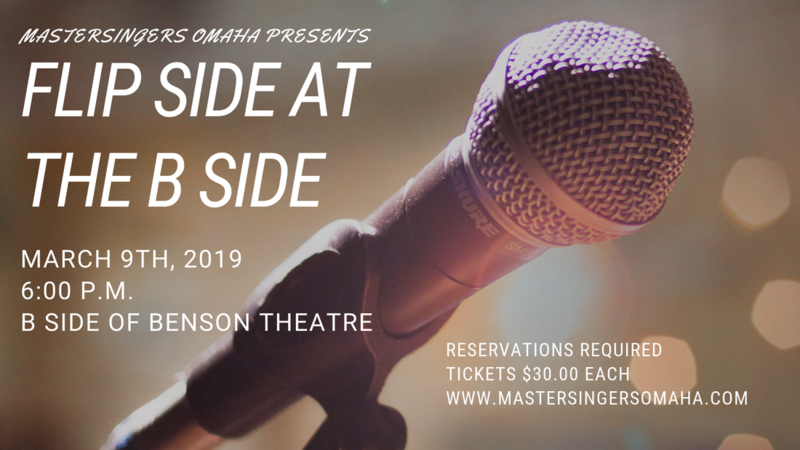 All proceeds directly support the MasterSingers Omaha so this is a great way to show your support for local music. Tickets are $30.00 each & include a buffet of delicious appetizers, an assortment of desserts, a drink ticket, & our cabaret performance. Reservations are required as space is limited. Additional drinks will be available for purchase at the event as well. We will also be hosting our famous raffle with several items up for grabs so bring some extra cash. Tickets are $1.00 each or 6 for $5.00.